Texas Then & Now lets you contrast the Texas of yesteryear with the Lone Star State you know and love today—showcasing a new/old scene from Texas past on every spread. Texas is a land of rapid and extreme transformation from the agrarian land of natives to a distant and primitive colonial outpost for global powers in France, Spain and Mexico. As modern Texas took shape, its landscape was one of hard work, agriculture, cattle and the hardscrabble life of those who chose to leave a more civilized world to try their hand in a new land. It’s hard to reconcile the Texas of bandit raids and hungry winters with the modern economic superpower that is today’s Lone Star State. Texas today has an official population of over 26 million people. Its economy is among the strongest in North America; if Texas were its own country, it would have the 12th-largest GDP in the world. It’s home to six of the nation’s 25-largest U.S. cities. And it has over 300,000 miles of highways, 11 deep-water ports and 100+ foreign embassies and consulates. Texas Then & Now showcases this radical transformation from remote outpost to prosperous metropolis—highlighting the history of both popular and lesser-known locations across the state. Texas Then & Now gives you glimpses of yesterday’s Texas on the Texas coast, such as the USS Lexington, North Beach and the Bluff in Corpus Christi; the Hotel Galvez and tragedy of the 1900 storm in Galveston; and popular historic and interesting sites around Houston including NASA and Rice University. The book also gives Then & Now shots from Austin and San Antonio in Central Texas, including the Alamo and Riverwalk, the Texas State Capitol, and Texas universities such as Baylor, Texas A&M and the University of Texas-Austin. Everything is big in Texas, and it takes a big book to share all of these amazing images from Texas past and present. 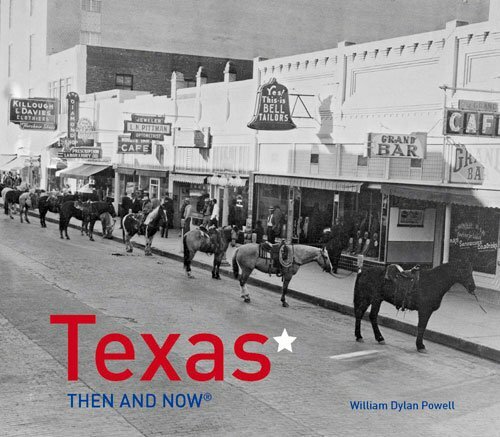 Texas Then & Now is 144 pages of amazing historical and original photographs of big Texas destinations and sights, all presented in a way that tells the colorful story of the Lone Star state. Order Texas Then & Now and get your copy in two days with Amazon Prime!